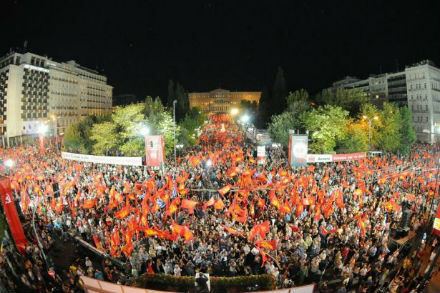 After the 20th September elections in Greece KKE announces its future agenda for working class struggle. At the immediate parlimentary elections on 20th September in Greece, the KKE received 301,632 votes with 5.55%,and maintained its 15 MPs. In an atmosphere of polarization, in particularly complex and unfavourable domestic and international conditions, the KKE leadership, has declared that they have waged a tough political battle, strengthening their contacts with broad working class and popular masses. Just before the elections in an interview on Jacobin, KKE leadership had announced their minimum programme as the emancipation of the Greek people from capitalism as well as the international exploitive connections. After 20th September elections in Greece, General Secretary of the CC of the KKE, Dimitris Koutsoumpas has announced their future agenda with similar concerns. Koutsoumpas stated that KKE will utilize its political, electoral and parliamentary strength to work for the comprehensive regroupment and strengthening of the labour-people’s movement, for the construction of a great social, people’s alliance. "The KKE is the only force whose struggle against the memoranda is at the same time a consistent struggle against the capitalist system itself, the system that also creates the predatory alliances which only bring new torments for the people, the country and the youth. The KKE, as always, will stand shoulder to shoulder with our people, consistently against any government that is ready to implement the barbaric memorandum. The correlation of forces in parliament will in any case produce a coalition government. Its programmatic statements are already ready-the implementation of the 3rd memorandum. Capital, its political and governmental personnel, together with the Troika, wants to win the people’s consent in order to implement the barbaric measures without resistance. They want a harmless, fake opposition so that its hands are free to wage the anti-people offensive. The election results as a whole are negative for the workers, the employees, the urban and rural self-employed, the youth, the pensioners. The KKE will consistently and continually struggle inside Parliament and inside the people’s movement in order to isolate the Nazi monstrosity, Golden Dawn. There needs to be a stronger KKE everywhere, in the workplaces, in the places of education, the popular neighbourhoods, in the places where the heart of our struggling and sorely tested people truly beats." In many popular neighbourhoods, where the workers live and work, the percentage of the KKE is much higher than its nationwide average. A characteristic example of this is that in 24 municipalities in Athens and Piraeus, the KKE’s percentage was higher than that of fascist GD and the social-democratic “Democratic Alignment” (PASOK-DIMAR) and achieved third place. We can refer as examples of this the municipality of Kaisariani where the KKE received 11.71%, Petroupoli with 9.94%, Haidari 8.49%, Nea Ionia 9.54%, Nikaia 9.29% and Peristeri 8.76%. The KKE won third place in 7 electoral regions, including the largest one Athens B with 6.8%, as well as Larisa with 7.25%. The KKE received a high percentage in a number of islands, in some places increasing its vote. It won 1st place in Ikaria with 33.2% (up from 31.8% in the January 2015 elections), in Fourni it was in 2nd place with 23.14%. It also received high percentages in the following islands: Ithaca 14.33%, Lesvos 10.68%, Lefkada 10.48%, Zakynthos 10.18%, Kephalonia 10.12%, Samos 10.05%.